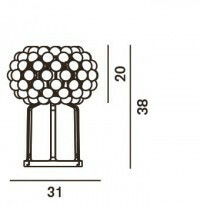 The Foscarini Caboche Piccola Replacement Kit 3 + 3 prongs 3-4 hooks is a spare part for the Caboche Tavolo Piccola table light as well as the Caboche Sospensione Piccola pendant light and the Caboche Parete Piccola wall light. 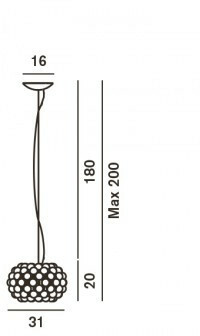 The Foscarini Caboche Piccola replacement kit 3 + 3 prongs 3-4 hooks can be used as a spare part for three lights. The lamps in question are the Caboche Tavolo Piccola table lamp and the Caboche Sospensione Piccola pendant lamp with a diameter of 31 cm as well as the Caboche Parete Piccola wall lamp. This kit contains a total of 6 prongs for hanging 3 and 4 balls.